This article is about the word Jehovah. For the deity, see God in Abrahamic religions. For other uses, see Jehovah (disambiguation). Jehovah (/dʒɪˈhoʊvə/) is a Latinization of the Hebrew יְהֹוָה, one vocalization of the Tetragrammaton יהוה (YHWH), the proper name of the God of Israel in the Hebrew Bible and one of the seven names of God in Judaism. The name Iehova at a Norwegian church. Most scholars believe "Jehovah" (also transliterated as "Yehowah") to be a hybrid form derived by combining the Latin letters JHVH with the vowels of Adonai. Some hold that there is evidence that a form of the Tetragrammaton similar to Jehovah may have been in use in Semitic and Greek phonetic texts and artifacts from Late Antiquity. Others say that it is the pronunciation Yahweh that is testified in both Christian and pagan texts of the early Christian era. Some Karaite Jews, as proponents of the rendering Jehovah, state that although the original pronunciation of יהוה has been obscured by disuse of the spoken name according to oral Rabbinic law, well-established English transliterations of other Hebrew personal names are accepted in normal usage, such as Joshua, Jeremiah, Isaiah or Jesus, for which the original pronunciations may be unknown. They also point out that "the English form Jehovah is quite simply an Anglicized form of Yehovah," and preserves the four Hebrew consonants "YHVH" (with the introduction of the "J" sound in English). Some argue that Jehovah is preferable to Yahweh, based on their conclusion that the Tetragrammaton was likely tri-syllabic originally, and that modern forms should therefore also have three syllables. Biblical scholar Francis B. Dennio, in an article he wrote, in the Journal of Biblical Literature, said: "Jehovah misrepresents Yahweh no more than Jeremiah misrepresents Yirmeyahu. The settled connotations of Isaiah and Jeremiah forbid questioning their right." Dennio argued that the form "Jehovah" is not a barbarism, but is the best English form available, being that it has for centuries gathered the necessary connotations and associations for valid use in English. According to a Jewish tradition developed during the 3rd to 2nd centuries BCE, the Tetragrammaton is written but not pronounced. When read, substitute terms replace the divine name where יְהֹוָה appears in the text. It is widely assumed, as proposed by the 19th-century Hebrew scholar Gesenius, that the vowels of the substitutes of the name—Adonai (Lord) and Elohim (God)—were inserted by the Masoretes to indicate that these substitutes were to be used. When יהוה precedes or follows Adonai, the Masoretes placed the vowel points of Elohim into the Tetragrammaton, producing a different vocalization of the Tetragrammaton יֱהֹוִה, which was read as Elohim. Based on this reasoning, the form יְהֹוָה (Jehovah) has been characterized by some as a "hybrid form", and even "a philological impossibility". Early modern translators disregarded the practice of reading Adonai (or its equivalents in Greek and Latin, Κύριος and Dominus) in place of the Tetragrammaton and instead combined the four Hebrew letters of the Tetragrammaton with the vowel points that, except in synagogue scrolls, accompanied them, resulting in the form Jehovah. This form, which first took effect in works dated 1278 and 1303, was adopted in Tyndale's and some other Protestant translations of the Bible. In the 1560 Geneva Bible, the Tetragrammaton is translated as Jehovah six times, four as the proper name, and two as place-names. In the 1611 King James Version, Jehovah occurred seven times. In the 1885 English Revised Version, the form Jehovah occurs twelve times. In the 1901 American Standard Version the form "Je-ho’vah" became the regular English rendering of the Hebrew יהוה, all throughout, in preference to the previously dominant "the LORD", which is generally used in the King James Version. It is also used in Christian hymns such as the 1771 hymn, "Guide Me, O Thou Great Jehovah". The most widespread theory is that the Hebrew term יְהֹוָה has the vowel points of אֲדֹנָי (adonai). Using the vowels of adonai, the composite hataf patah ֲ under the guttural alef א becomes a sheva ְ under the yod י, the holam ֹ is placed over the first he ה, and the qamats ָ is placed under the vav ו, giving יְהֹוָה (Jehovah). When the two names, יהוה and אדני, occur together, the former is pointed with a hataf segol ֱ under the yod י and a hiriq ִ under the second he ה, giving יֱהֹוִה, to indicate that it is to be read as (elohim) in order to avoid adonai being repeated. Taking the spellings at face value may have been as a result of not knowing about the Q're perpetuum, resulting in the transliteration Yehowah and derived variants. Emil G. Hirsch was among the modern scholars that recognized "Jehovah" to be "grammatically impossible". יְהֹוָה appears 6,518 times in the traditional Masoretic Text, in addition to 305 instances of יֱהֹוִה (Jehovih). The pronunciation Jehovah is believed to have arisen through the introduction of vowels of the qere—the marginal notation used by the Masoretes. In places where the consonants of the text to be read (the qere) differed from the consonants of the written text (the kethib), they wrote the qere in the margin to indicate that the kethib was read using the vowels of the qere. For a few very frequent words the marginal note was omitted, referred to as q're perpetuum. One of these frequent cases was God's name, which was not to be pronounced in fear of profaning the "ineffable name". Instead, wherever יהוה (YHWH) appears in the kethib of the biblical and liturgical books, it was to be read as אֲדֹנָי (adonai, "My Lord [plural of majesty]"), or as אֱלֹהִים (elohim, "God") if adonai appears next to it. [unreliable source?] This combination produces יְהֹוָה (yehovah) and יֱהֹוִה (yehovih) respectively. יהוה is also written ’ה, or even ’ד, and read ha-Shem ("the name"). Scholars are not in total agreement as to why יְהֹוָה does not have precisely the same vowel points as adonai. The use of the composite hataf segol ֱ in cases where the name is to be read, "elohim", has led to the opinion that the composite hataf patah ֲ ought to have been used to indicate the reading, "adonai". It has been argued conversely that the disuse of the patah is consistent with the Babylonian system, in which the composite is uncommon. The spelling of the Tetragrammaton and connected forms in the Hebrew Masoretic text of the Bible, with vowel points shown in red. The table below shows the vowel points of Yehovah and Adonay, indicating the simple sheva in Yehovah in contrast to the hataf patah in Adonay. As indicated to the right, the vowel points used when YHWH is intended to be pronounced as Adonai are slightly different to those used in Adonai itself. The difference between the vowel points of ’ǎdônây and YHWH is explained by the rules of Hebrew morphology and phonetics. Sheva and hataf-patah were allophones of the same phoneme used in different situations: hataf-patah on glottal consonants including aleph (such as the first letter in Adonai), and simple sheva on other consonants (such as the Y in YHWH). The earliest available Latin text to use a vocalization similar to Jehovah dates from the 13th century. The Brown-Driver-Briggs Lexicon suggested that the pronunciation Jehovah was unknown until 1520 when it was introduced by Galatinus, who defended its use. In English it appeared in William Tyndale's translation of the Pentateuch ("The Five Books of Moses") published in 1530 in Germany, where Tyndale had studied since 1524, possibly in one or more of the universities at Wittenberg, Worms and Marburg, where Hebrew was taught. The spelling used by Tyndale was "Iehouah"; at that time, "I" was not distinguished from J, and U was not distinguished from V. The original 1611 printing of the Authorized King James Version used "Iehovah". Tyndale wrote about the divine name: "IEHOUAH [Jehovah], is God's name; neither is any creature so called; and it is as much to say as, One that is of himself, and dependeth of nothing. Moreover, as oft as thou seest LORD in great letters (except there be any error in the printing), it is in Hebrew Iehouah, Thou that art; or, He that is." The name is also found in a 1651 edition of Ramón Martí's Pugio fidei. The name Jehovah appeared in all early Protestant Bibles in English, except Coverdale's translation in 1535. The Roman Catholic Douay-Rheims Bible used "the Lord", corresponding to the Latin Vulgate's use of "Dominus" (Latin for "Adonai", "Lord") to represent the Tetragrammaton. The Authorized King James Version, which used "Jehovah" in a few places, most frequently gave "the LORD" as the equivalent of the Tetragrammaton. The name Jehovah appeared in John Rogers' Matthew Bible in 1537, the Great Bible of 1539, the Geneva Bible of 1560, Bishop's Bible of 1568 and the King James Version of 1611. More recently, it has been used in the Revised Version of 1885, the American Standard Version in 1901, and the New World Translation of the Holy Scriptures of Jehovah's Witnesses in 1961. At Exodus 6:3–6, where the King James Version has Jehovah, the Revised Standard Version (1952), the New American Standard Bible (1971), the New International Version (1978), the New King James Version (1982), the New Revised Standard Version (1989), the New Century Version (1991), and the Contemporary English Version (1995) give "LORD" or "Lord" as their rendering of the Tetragrammaton, while the New Jerusalem Bible (1985), the Amplified Bible (1987), the New Living Translation (1996, revised 2007), the English Standard Version (2001), and the Holman Christian Standard Bible (2004) use the form Yahweh. "Jehovist" scholars, largely earlier than the 20th century, who believe /dʒəˈhoʊvə/ to be the original pronunciation of the divine name, argue that the Hebraic vowel-points and accents were known to writers of the scriptures in antiquity and that both Scripture and history argue in favor of their ab origine status to the Hebrew language. Some members of Karaite Judaism, such as Nehemia Gordon, hold this view. The antiquity of the vowel points and of the rendering Jehovah was defended by various scholars, including Michaelis, Drach, Stier, William Fulke (1583), Johannes Buxtorf, his son Johannes Buxtorf II, and John Owen  (17th century); Peter Whitfield and John Gill (18th century), John Moncrieff  (19th century), Johann Friedrich von Meyer (1832) Thomas D. Ross has given an account of the controversy on this matter in England down to 1833. G. A. Riplinger, John Hinton, Thomas M. Strouse, are more recent defenders of the authenticity of the vowel points. Jehovist writers such as Nehemia Gordon, who helped make a translation of the "Dead Sea Scrolls", have acknowledged the general agreement among scholars that the original pronunciation of the Tetragrammaton was probably Yahweh, and that the vowel points now attached to the Tetragrammaton were added to indicate that Adonai was to be read instead, as seen in the alteration of those points after prefixes. He wrote: "There is a virtual scholarly consensus concerning this name" and "this is presented as fact in every introduction to Biblical Hebrew and every scholarly discussion of the name." Gordon, disputing this consensus, wrote, "However, this consensus is not based on decisive proof. We have seen that the scholarly consensus concerning Yahweh is really just a wild guess," and went on to say that the vowel points of Adonai are not correct. He argued that "the name is really pronounced Ye-ho-vah with the emphasis on 'vah'. Pronouncing the name Yehovah with the emphasis on 'ho' (as in English Jehovah) would quite simply be a mistake." The Book of Cosri and commentator Rabbi Judab Muscatus, which claim that the vowel points were taught to Adam by God. Gill quoted Elia Levita, who said, "There is no syllable without a point, and there is no word without an accent," as showing that the vowel points and the accents found in printed Hebrew Bibles have a dependence on each other, and so Gill attributed the same antiquity to the accents as to the vowel points. Gill acknowledged that Levita, "first asserted the vowel points were invented by "the men of Tiberias", but made reference to his condition that "if anyone could convince him that his opinion was contrary to the book of Zohar, he should be content to have it rejected." Gill then alludes to the book of Zohar, stating that rabbis declared it older than the Masoretes, and that it attests to the vowel-points and accents. William Fulke, John Gill, John Owen, and others held that Jesus Christ referred to a Hebrew vowel point or accent at Matthew 5:18, indicated in the King James Version by the word tittle. The 1602 Spanish Bible (Reina-Valera/Cipriano de Valera) used the name Iehova and gave a lengthy defense of the pronunciation Jehovah in its preface. Despite Jehovist claims that vowel signs are necessary for reading and understanding Hebrew, modern Hebrew (apart from young children's books, some formal poetry and Hebrew primers for new immigrants), is written without vowel points. The Torah scrolls do not include vowel points, and ancient Hebrew was written without vowel signs. The Dead Sea Scrolls, discovered in 1946 and dated from 400 BC to 70 AD, include texts from the Torah or Pentateuch and from other parts of the Hebrew Bible, and have provided documentary evidence that, in spite of claims to the contrary, the original Hebrew texts were in fact written without vowel points. Menahem Mansoor's The Dead Sea Scrolls: A College Textbook and a Study Guide claims the vowel points found in printed Hebrew Bibles were devised in the 9th and 10th centuries. The argument that vowel points are necessary for learning to read Hebrew is refuted by the fact that the Samaritan text of the Bible is read without them and that several other Semitic languages, kindred to Hebrew, are written without any indications of the vowels. The books used in synagogue worship have always been without vowel points, which, unlike the letters, have thus never been treated as sacred. The Qere Kethib marginal notes give variant readings only of the letters, never of the points, an indication either that these were added later or that, if they already existed, they were seen as not so important. The Kabbalists drew their mysteries only from the letters and completely disregarded the points, if there were any. In several cases, ancient translations from the Hebrew Bible (Septuagint, Targum, Aquila of Sinope, Symmachus, Theodotion, Jerome) read the letters with vowels different from those indicated by the points, an indication that the texts from which they were translating were without points. The same holds for Origen's transliteration of the Hebrew text into Greek letters. Jerome expressly speaks of a word in Habakkuk 3:5, which in the present Masoretic Text has three consonant letters and two vowel points, as being of three letters and no vowel whatever. Neither the Jerusalem Talmud nor the Babylonian Talmud (in all their recounting of Rabbinical disputes about the meaning of words), nor Philo nor Josephus, nor any Christian writer for several centuries after Christ make any reference to vowel points. In the 16th and 17th centuries, various arguments were presented for and against the transcription of the form Jehovah. John Drusius (Johannes Van den Driesche) (1550–1616) Tetragrammaton, sive de Nomine Die proprio, quod Tetragrammaton vocant (1604) Drusius stated "Galatinus first led us to this mistake ... I know [of] nobody who read [it] thus earlier.."). John Drusius wrote that neither יְהֹוָה nor יֱהֹוִה accurately represented God's name. Louis Cappel (1585–1658) De nomine tetragrammato (1624) Lewis Cappel reached the conclusion that Hebrew vowel points were not part of the original Hebrew language. This view was strongly contested by John Buxtorff the elder and his son. John Buxtorf (1564–1629) Disserto de nomine JHVH (1620); Tiberias, sive Commentarius Masoreticus (1664) John Buxtorf the elder  opposed the views of Elia Levita regarding the late origin (invention by the Masoretes) of the Hebrew vowel points, a subject which gave rise to the controversy between Louis Cappel and his (e.g. John Buxtorf the elder's) son, Johannes Buxtorf II the younger. Johannes Buxtorf II (1599–1664) Tractatus de punctorum origine, antiquitate, et authoritate, oppositus Arcano puntationis revelato Ludovici Cappelli (1648) Continued his father's arguments that the pronunciation and therefore the Hebrew vowel points resulting in the name Jehovah have divine inspiration. Thomas Gataker (1574–1654) De Nomine Tetragrammato Dissertaio (1645)  See Memoirs of the Puritans Thomas Gataker. In A Dictionary of the Bible (1863), William Robertson Smith summarized these discourses, concluding that "whatever, therefore, be the true pronunciation of the word, there can be little doubt that it is not Jehovah". Despite this, he consistently uses the name Jehovah throughout his dictionary and when translating Hebrew names. Some examples include Isaiah [Jehovah's help or salvation], Jehoshua [Jehovah a helper], Jehu [Jehovah is He]. In the entry, Jehovah, Smith writes: "JEHOVAH (יְהֹוָה, usually with the vowel points of אֲדֹנָי; but when the two occur together, the former is pointed יֱהֹוִה, that is with the vowels of אֱלֹהִים, as in Obad. i. 1, Hab. iii. 19:" This practice is also observed in many modern publications, such as the New Compact Bible Dictionary (Special Crusade Edition) of 1967 and Peloubet's Bible Dictionary of 1947. William Tyndale, in his 1530 translation of the first five books of the English Bible, at Exodus 6:3 renders the divine name as Iehovah. In his foreword to this edition he wrote: "Iehovah is God's name... Moreover, as oft as thou seeist LORD in great letters (except there be any error in the printing) it is in Hebrew Iehovah." The Great Bible (1539) renders Jehovah in Psalm 33:12 and Psalm 83:18. The Geneva Bible (1560) translates the Tetragrammaton as Jehovah in Exodus 6:3, Psalm 83:18, and two other times as place-names, Genesis 22:14 and Exodus 17:15. In the Bishop's Bible (1568), the word Jehovah occurs in Exodus 6:3 and Psalm 83:18. The Authorized King James Version (1611) renders Jehovah in Exodus 6:3, Psalm 83:18, Isaiah 12:2, Isaiah 26:4, and three times in compound place names at Genesis 22:14, Exodus 17:15 and Judges 6:24. Webster's Bible Translation (1833) by Noah Webster, a revision of the King James Bible, contains the form Jehovah in all cases where it appears in the original King James Version, as well as another seven times in Isaiah 51:21, Jeremiah 16:21; 23:6; 32:18; 33:16, Amos 5:8 and Micah 4:13. Young's Literal Translation by Robert Young (1862, 1898) renders the Tetragrammaton as Jehovah 6,831 times. The Julia E. Smith Parker Translation (1876) considered the first complete translation of the Bible into English by a woman. This Bible version was titled The Holy Bible: Containing the Old and New Testaments; Translated Literally from the Original Tongues. This translation prominently renders the Tetragrammaton as Jehovah throughout the entire Old Testament. The English Revised Version (1881-1885, published with the Apocrypha in 1894) renders the Tetragrammaton as Jehovah where it appears in the King James Version, and another eight times in Exodus 6:2,6–8, Psalm 68:20, Isaiah 49:14, Jeremiah 16:21 and Habakkuk 3:19. The Darby Bible (1890) by John Nelson Darby renders the Tetragrammaton as Jehovah 6,810 times. The American Standard Version (1901) renders the Tetragrammaton as Je-ho’vah in 6,823 places in the Old Testament. The Modern Reader's Bible (1914) an annotated reference study Bible based on the English Revised Version of 1894 by Richard Moulton, renders Jehovah where it appears in the English Revised Version of 1894. The Holy Scriptures (1936, 1951), Hebrew Publishing Company, revised by Alexander Harkavy, a Hebrew Bible translation in English, contains the form Jehovah where it appears in the King James Version except in Isaiah 26:4. The Modern Language Bible—The New Berkeley Version in Modern English (1969) renders Jehovah in Genesis 22:14, Exodus 3:15, Exodus 6:3 and Isaiah 12:2. This translation was a revision of an earlier translation by Gerrit Verkuyl. The New English Bible (1970) published by Oxford University Press uses Jehovah in Exodus 3:15-16 and 6:3, and in four place names at Genesis 22:14, Exodus 17:15, Judges 6:24 and Ezekiel 48:35. A total of 7 times. The King James II Version (1971) by Jay P. Green, Sr., published by Associated Publishers and Authors, renders Jehovah at Psalms 68:4 in addition to where it appears in the Authorized King James Version, a total of 8 times. The Living Bible (1971) by Kenneth N. Taylor, published by Tyndale House Publishers, Illinois, Jehovah appears 500 times according to the Living Bible Concordance by Jack Atkeson Speer and published by Poolesville Presbyterian Church; 2nd edition (1973). The Bible in Living English (1972) by Steven T. Byington, published by the Watchtower Bible and Tract Society, renders the name Jehovah throughout the Old Testament over 6,800 times. Green's Literal Translation (1985) by Jay P. Green, published by Sovereign Grace Publishers, renders the Tetragrammaton as Jehovah 6,866 times. The 21st Century King James Version (1994), published by Deuel Enterprises, Inc., renders Jehovah at Psalms 68:4 in addition to where it appears in the Authorized King James Version, a total of 8 times. A revision including the Apocrypha entitled the Third Millennium Bible (1998) also renders Jehovah in the same verses. The American King James Version (1999) by Michael Engelbrite renders Jehovah in all the places where it appears in the Authorized King James Version. The Recovery Version (1999, 2003, 2016) renders the Tetragrammaton as Jehovah throughout the Old Testament 6,841 times. The New Heart English Translation (Jehovah Edition) (2010) [a Public Domain work with no copyright] uses "Jehovah" 6837 times. In the Emphatic Diaglott (1864) a Greek-English Interlinear translation of the New Testament by Benjamin Wilson, the name Jehovah appears eighteen times. The Five Pauline Epistles, A New Translation (1900) by William Gunion Rutherford uses the name Jehovah six times in the Book of Romans. In the New World Translation of the Holy Scriptures (1961, 1984, 2013) published by the Watchtower Bible and Tract Society, Jehovah appears 7,199 times in the 1961 edition, 7,210 times in the 1984 revision and 7,216 times in the 2013 revision, comprising 6,979 instances in the Old Testament, and 237 in the New Testament—including 70 of the 78 times where the New Testament quotes an Old Testament passage containing the Tetragrammaton, where the Tetragrammaton does not appear in any extant Greek manuscript. The Original Aramaic Bible in Plain English (2010) by David Bauscher, a self-published English translation of the New Testament, from the Aramaic of The Peshitta New Testament with a translation of the ancient Aramaic Peshitta version of Psalms & Proverbs, contains the word "JEHOVAH" approximately 239 times in the New Testament, where the Peshitta itself does not. In addition, "Jehovah" also appears 695 times in the Psalms and 87 times in Proverbs, totaling 1,021 instances. The Divine Name King James Bible (2011) - Uses JEHOVAH 6,973 times throughout the OT, and LORD with Jehovah in parentheses 128 times in the NT. The Douay Version of 1609 renders the phrase in Exodus 6:3 as "and my name Adonai", and in its footnote says: "Adonai is not the name here vttered to Moyses but is redde in place of the vnknowen name". 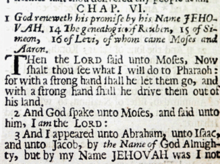 The Challoner revision (1750) uses ADONAI with a note stating, "some moderns have framed the name Jehovah, unknown to all the ancients, whether Jews or Christians." Various Messianic Jewish Bible translations use Adonai (Complete Jewish Bible (1998), Tree of Life Version (2014) or Hashem (Orthodox Jewish Bible (2002)). Sacred Name King James Bible (2005). The Revised Standard Version (1952), an authorized revision of the American Standard Version of 1901, replaced all 6,823 usages of Jehovah in the 1901 text with "LORD" or "GOD", depending on whether the Hebrew of the verse in question is read "Adonai" or "Elohim" in Jewish practice. A footnote on Exodus 3:15 says: "The word LORD when spelled with capital letters, stands for the divine name, YHWH." The preface states: "The word 'Jehovah' does not accurately represent any form of the name ever used in Hebrew". The New American Bible (1970, revised 1986, 1991). Its footnote to Genesis 4:25–26 says: "... men began to call God by his personal name, Yahweh, rendered as "the LORD" in this version of the Bible." The New American Standard Bible (1971, updated 1995), another revision of the 1901 American Standard Version, followed the example of the Revised Standard Version. Its footnotes to Exodus 3:14 and 6:3 state: "Related to the name of God, YHWH, rendered LORD, which is derived from the verb HAYAH, to be"; "Heb YHWH, usually rendered LORD". In its preface it says: "It is known that for many years YHWH has been transliterated as Yahweh, however no complete certainty attaches to this pronunciation." The Bible in Today's English (Good News Bible), published by the American Bible Society (1976). Its preface states: "the distinctive Hebrew name for God (usually transliterated Jehovah or Yahweh) is in this translation represented by 'The Lord'." A footnote to Exodus 3:14 states: "I am sounds like the Hebrew name Yahweh traditionally transliterated as Jehovah." The New International Version (1978, revised 2011). Footnote to Exodus 3:15, "The Hebrew for LORD sounds like and may be related to the Hebrew for I AM in verse 14." The New King James Version (1982), though based on the King James Version, replaces JEHOVAH wherever it appears in the Authorized King James Version with "LORD", and adds a note: "Hebrew YHWH, traditionally Jehovah", except at Psalms 68:4, Isaiah 12:2, Isaiah 26:4 and Isaiah 38:11 where the tetragrammaton is rendered "Yah". The God's Word Translation (1985). The New Revised Standard Version (1990), a revision of the Revised Standard Version uses "LORD" and "GOD" exclusively. The New Century Version (1987, revised 1991). The New International Reader's Version (1995). The Contemporary English Version or CEV (also known as Bible for Today's Family) (1995). The English Standard Version (2001). Footnote to Exodus 3:15, "The word LORD, when spelled with capital letters, stands for the divine name, YHWH, which is here connected with the verb hayah, 'to be'." The Common English Bible (2011). The Modern English Version (2014). The Bible, An American Translation (1939) by J.M. Powis Smith and Edgar J. Goodspeed. Generally uses "LORD" but uses Yahweh and/or "Yah" exactly where Jehovah appears in the King James Version except in Psalms 83:18, "Yahweh" also appears in Exodus 3:15. The Amplified Bible (1965, revised 1987) generally uses Lord, but translates Exodus 6:3 as: "I appeared to Abraham, to Isaac, and to Jacob as God Almighty [El-Shaddai], but by My name the Lord [Yahweh—the redemptive name of God] I did not make Myself known to them [in acts and great miracles]." The New Living Translation (1996), produced by Tyndale House Publishers as a successor to the Living Bible, generally uses LORD, but uses Yahweh in Exodus 3:15 and 6:3. The Holman Christian Standard Bible (2004, revised 2008) mainly uses LORD, but in its second edition increased the number of times it uses Yahweh from 78 to 495 (in 451 verses). Rotherham's Emphasized Bible (1902) retains "Yahweh" throughout the Old Testament. The New Jerusalem Bible (1985). The Christian Community Bible (1988) is a translation of the Christian Bible in the English language originally produced in the Philippines and uses "Yahweh". The World English Bible (1997) is based on the 1901 American Standard Version, but uses "Yahweh" instead of "Jehovah". The Lexham English Bible (2011) uses "Yahweh" in the Old Testament. Names of God Bible (2011, 2014), edited by Ann Spangler and published by Baker Publishing Group. The core text of the 2011 edition uses the God's Word translation. The core text of the 2014 edition uses the King James Version, and includes Jehovah next to Yahweh where "LORD Jehovah" appears in the source text. The print edition of both versions have divine names printed in brown and includes a commentary. Both editions use "Yahweh" in the Old Testament. The Sacred Scriptures Bethel Edition (1981) is a Sacred Name Bible which uses the name "Yahweh" in both the Old and New Testaments (Chamberlin p. 51-3). It was produced by the Assemblies of Yahweh elder, the late Jacob O. Meyer, based on the American Standard Version of 1901. Following the Middle Ages, some churches and public buildings across Europe, both before and after the Protestant Reformation were decorated with the name Jehovah. For example, the Coat of Arms of Plymouth (UK) City Council bears the Latin inscription, Turris fortissima est nomen Jehova (English, "The name of Jehovah is the strongest tower"), derived from Proverbs 18:10. Jehovah has been a popular English word for the personal name of God for several centuries. Christian hymns feature the name. The form "Jehovah" also appears in reference books and novels, for example, appearing several times in the novel The Greatest Story Ever Told by Roman Catholic author Fulton Oursler. Some religious groups, notably Jehovah's Witnesses and proponents of the King-James-Only movement, make prominent use of the name. In Mormonism, "Jehovah" is thought to be the name by which Jesus was known prior to his birth; references to "the LORD" in the KJV Old Testament are therefore understood to be references to the pre-mortal Jesus. God the Father, who is regarded as a separate individual, is sometimes referred to by the proper name "Elohim". Excerpts from Raymond Martin's Pugio Fidei adversus Mauros et Judaeos (1270, p. 559), containing the phrase "Jehova, sive Adonay, qvia Dominus es omnium" (Jehovah, or Adonay, for you are the Lord of all). A Latin rendering of the Tetragrammaton has been the form "Jova", sounding very similar to "Jehovah". Transcriptions of יְהֹוָה similar to Jehovah occurred as early as the 12th century. Wikimedia Commons has media related to Jehovah & Tetragrammaton. ^ The Imperial Bible-Dictionary, Volume 1, p. 856. "Jehovah, on the other hand, the personality of the Supreme is more distinctly expressed. It is every where a proper name, denoting the personal God and him only; whereas Elohim partakes more of the character of a common noun, denoting usually, indeed, but not necessarily nor uniformly, the Supreme. Elohim may be grammatically defined by the article, or by having a suffix attached to it, or by being in construction with a following noun. The Hebrew may say the Elohim, the true God, in opposition to all false gods; but he never says the Jehovah, for Jehovah is the name of the true God only. He says again and again my God; but never my Jehovah, for when he says my God, he means Jehovah. He speaks of the God of Israel, but never of the Jehovah of Israel, for there is no other Jehovah. He speaks of the living God, but never of the living Jehovah, for he cannot conceive of Jehovah as other than living. It is obvious, therefore, that the name Elohim is the name of more general import, seeing that it admits of definition and limitation in these various ways; whereas Jehovah is the more specific and personal name, altogether incapable of limitation." ^ a b Schaff, Philip -Yahweh The New Schaff-Herzog Encyclopedia of Religious Knowledge Volume XII, Paper Book House, Grand Rapids, Michigan, 1950, page 480. ^ a b In the 7th paragraph of Introduction to the Old Testament of the New English Bible, Sir Godfry Driver wrote, "The early translators generally substituted 'Lord' for [YHWH]. [...] The Reformers preferred Jehovah, which first appeared as Iehouah in 1530 A.D., in Tyndale's translation of the Pentateuch (Exodus 6.3), from which it passed into other Protestant Bibles." ^ a b English Standard Version Translation Oversight Committee Preface to the English Standard Version Quote: "When the vowels of the word adonai are placed with the consonants of YHWH, this results in the familiar word Jehovah that was used in some earlier English Bible translations. As is common among English translations today, the ESV usually renders the personal name of God (YHWH) with the word Lord (printed in small capitals)." ^ GOD, NAMES OF – 5. Yahweh (Yahweh) in New Schaff-Herzog Encyclopedia of Religious Knowledge, Vol. XII: Trench – Zwingli Retrieved 19 November 2014. ^ a b c Roy Kotansky, Jeffrey Spier, "The 'Horned Hunter' on a Lost Gnostic Gem", The Harvard Theological Review, Vol. 88, No. 3 (Jul., 1995), p. 318. Quote: "Although most scholars believe "Jehovah" to be a late (c. 1100 CE) hybrid form derived by combining the Latin letters JHVH with the vowels of Adonai (the traditionally pronounced version of יהוה), many magical texts in Semitic and Greek establish an early pronunciation of the divine name as both Yehovah and Yahweh"
^ Jarl Fossum and Brian Glazer in their article Seth in the Magical Texts (Zeitschrift für Papyrologie und Epigraphie 100 (1994), p. 86-92, reproduced here , give the name "Yahweh" as the source of a number of names found in pagan magical texts: Ἰάβας (p. 88), Iaō (described as "a Greek form of the name of the Biblical God, Yahweh", on p. 89), Iaba, Iaē, Iaēo, Iaō, Iaēō (p. 89). On page 92, they call "Iaō" "the divine name". ^ "Eerdmans Dictionary of the Bible". ^ Kristin De Troyer The Names of God, Their Pronunciation and Their Translation, – lectio difficilior 2/2005. Quote: "IAO can be seen as a transliteration of YAHU, the three-letter form of the Name of God" (p. 6). ^ a b Dennio, Francis B., "On the Use of the Word Jehovah in Translating the Old Testament", Journal of Biblical Literature 46, (1927), pages 147–148. Dennio wrote: "Jehovah misrepresents Yahweh no more than Jeremiah misrepresents Yirmeyahu. The settled connotations of Isaiah and Jeremiah forbid questioning their right. Usage has given them the connotation proper for designating the personalities with which these words represent. Much the same is true of Jehovah. It is not a barbarism. It has already many of the connotations needed for the proper name of the Covenant God of Israel. There is no word which can faintly compare with it. For centuries it has been gathering these connotations. No other word approaches this name in the fullness [sic] of associations required. The use of any other word falls far short of the proper ideas that it is a serious blemish in a translation." ^ Jones, Scott. "יהוה Jehovah יהוה". Archived from the original on 4 August 2011. ^ Carl D. Franklin – Debunking the Myths of Sacred Namers יהוה – Christian Biblical Church of God – December 9, 1997 – Retrieved 25 August 2011. ^ R. Laird Harris, "The Pronunciation of the Tetragram," in John H. Skilton (ed. ), The Law and the Prophets: Old Testament Studies Prepared in Honor of Oswald Thompson Allis (Presbyterian and Reformed, 1974), 224. ^ a b c "NAMES OF GOD - JewishEncyclopedia.com". ^ The Latin Vulgate of St. Jerome renders the name as Adonai at Exodus 6:3 rather than as Dominus. Moore, George Foot (1911). "Jehovah" . In Chisholm, Hugh (ed.). Encyclopædia Britannica. 15 (11th ed.). Cambridge University Press. p. 311. ^ In the 7th paragraph of Introduction to the Old Testament of the New English Bible, Sir Godfrey Driver wrote of the combination of the vowels of Adonai and Elohim with the consonants of the divine name, that it "did not become effective until Yehova or Jehova or Johova appeared in two Latin works dated in A.D. 1278 and A.D. 1303; the shortened Jova (declined like a Latin noun) came into use in the sixteenth century. The Reformers preferred Jehovah, which first appeared as Iehouah in 1530 A.D., in Tyndale's translation of the Pentateuch (Exodus 6.3), from which it passed into other Protestant Bibles." ^ The Geneva Bible uses the form "Jehovah" in Exodus 6:3, Psalm 83:18, Jeremiah 16:21, Jeremiah 32:18, Genesis 22:14, and Exodus 17:15. ^ At Gen.22:14; Ex.6:3; 17:15; Jg.6:24; Ps.83:18, Is.12:2; 26:4. Strong's Exhaustive Concordance of the Bible (Iowa Falls: Word, 1994), 722. ^ According to the preface, this was because the translators felt that the "Jewish superstition, which regarded the Divine Name as too sacred to be uttered, ought no longer to dominate in the English or any other version of the Old Testament". ^ The original hymn, without "Jehovah", was composed in Welsh in 1745; the English translation, with "Jehovah", was composed in 1771 (Guide Me, O Thou Great Jehovah). ^ a b Paul Joüon and T. Muraoka. A Grammar of Biblical Hebrew (Subsidia Biblica). Part One: Orthography and Phonetics. Rome : Editrice Pontificio Istituto Biblio, 1996. ISBN 978-8876535956. Quote from Section 16(f)(1)" "The Qre is יְהֹוָה the Lord, whilst the Ktiv is probably(1) יַהְוֶה (according to ancient witnesses)." "Note 1: In our translations, we have used Yahweh, a form widely accepted by scholars, instead of the traditional Jehovah"
^ a b c d "JEHOVAH - JewishEncyclopedia.com". ^ a b c The vowel points of Jehovah – Jehovah. Dictionary Definitions. askdefinebeta.com. Retrieved 20 August 2015. ^ The Divine Name – New Church Review, Volume 15, page 89. Retrieved 22 August 2015. ^ Dahlia M. Karpman "Tyndale's Response to the Hebraic Tradition" in Studies in the Renaissance, Vol. 14 (1967)), pp. 113, 118, 119. Note: Westcott, in his survey of the English Bible, wrote that Tyndale "felt by a happy instinct the potential affinity between Hebrew and English idioms, and enriched our language and thought for ever with the characteristics of the Semitic mind." ^ The first English-language book to make a clear distinction between I and J was published in 1634. (The Cambridge History of the English Language, Richard M. Hogg, (Cambridge University Press 1992 ISBN 0-521-26476-6, p. 39). It was also only by the mid-1500s that V was used to represent the consonant and U the vowel sound, while capital U was not accepted as a distinct letter until many years later (Letter by Letter: An Alphabetical Miscellany, Laurent Pflughaupt, (Princeton Architectural Press ISBN 978-1-56898-737-8) pp. 123–124). ^ William Tyndale, Doctrinal Treatises, ed. Henry Walter (Cambridge, 1848), p. 408. Maas, Anthony John (1910). "Jehovah (Yahweh)" . In Herbermann, Charles (ed.). Catholic Encyclopedia. 8. New York: Robert Appleton Company. ^ An Essay on the Antiquity and Utility of the Hebrew Vowel-Points (Glasgow: John Reid & Co., 1833). ^ Blätter für höhere Wahrheit vol. 11, 1832, pp. 305, 306. ^ a b "Who is Yahweh? – Ridiculous KJV Bible Corrections". Av1611.com. Retrieved 2013-03-26. ^ One of the definitions of "tittle" in the Merriam-Webster Dictionary is "a point or small sign used as a diacritical mark in writing or printing". ^ For the meanings of the word κεραία in the original texts of Matthew 5:18 and Luke 16:17 see Liddell and Scott and for a more modern scholarly view of its meaning in that context see Strong's Greek Dictionary. ^ "Search => [word] => tittle :: 1828 Dictionary :: Search the 1828 Noah Webster's Dictionary of the English Language (FREE)". 1828.mshaffer.com. 2009-10-16. Retrieved 2013-03-26. ^ "Torah and Laining (Cantillation)". ^ "The Dead Sea Scrolls". ^ "Build a Free Website with Web Hosting – Tripod" (PDF). ^ Smith commented, "In the decade of dissertations collected by Reland, Fuller, Gataker, and Leusden do battle for the pronunciation Jehovah, against such formidable antagonists as Drusius, Amama, Cappellus, Buxtorf, and Altingius, who, it is scarcely necessary to say, fairly beat their opponents out of the field; "the only argument of any weight, which is employed by the advocates of the pronunciation of the word as it is written being that derived from the form in which it appears in proper names, such as Jehoshaphat, Jehoram, &c. [...] Their antagonists make a strong point of the fact that, as has been noticed above, two different sets of vowel points are applied to the same consonants under certain circumstances. To this Leusden, of all the champions on his side, but feebly replies. [...] The same may be said of the argument derived from the fact that the letters מוכלב, when prefixed to יהוה, take, not the vowels which they would regularly receive were the present pronunciation true, but those with which they would be written if אֲדֹנָי, adonai, were the reading; and that the letters ordinarily taking dagesh lene when following יהוה would, according to the rules of the Hebrew points, be written without dagesh, whereas it is uniformly inserted." ^ "Introduction to the Old Testament". ^ Revised New World Translation of the Holy Scriptures. Accessed 14 October 2013. ^ "Douay-Rheims Catholic Bible, Book Of Exodus Chapter 6". ^ "Preface to the Revised Standard Version of the Bible (1971)". ^ "Preface to the New American Standard Bible". Archived from the original on 2006-12-07. ^ "The World English Bible (WEB) FAQ". ^ Hebraic Roots Bible by Esposito. ^ Full text of "The Greatest Story Ever Told A Tale Of The Greatest Life Ever Lived" – Internet Archive – Retrieved 2 September 2011. ^ "How God's Name Has Been Made Known". Awake! : 20. December 2007. The commonly used form of God’s name in English is Jehovah, translated from the Hebrew [Tetragrammaton], which appears some 7,000 times in the Bible. ^ He speaks of it as anonymous: "the writer 'On Interpretations'". Aristotle's De Interpretatione does not speak of Egyptians. ^ Charles William King, The Gnostics and their remains: Ancient and Mediaeval (1887), pp. 199–200. ^ Article in the Aster magazine (January 2000), the official periodical of the Greek Evangelical Church. ^ Greek translation by Ioannes Stanos. ^ Published by the British and Foreign Bible Society. ^ Dogmatike tes Orthodoxou Katholikes Ekklesias (Dogmatics of the Orthodox Catholic Church), 3rd ed., 1997 (c. 1958), Vol. 1, p. 229. ^ a b c Pugio Fidei, in which Martin argued that the vowel points were added to the Hebrew text only in the 10th century (Thomas D. Ross, The Battle over the Hebrew Vowel Points Examined Particularly as Waged in England, p. 5). ^ Dahlia M. Karpman, "Tyndale's Response to the Hebraic Tradition" (Studies in the Renaissance, Vol. 14 (1967)), p. 121. ^ a b See comments at Exodus 6:2, 3 in his Critical Remarks on the Hebrew Scriptures (1800). ^ Rev. Richard Barrett's A Synopsis of Criticisms upon Passages of the Old Testament (1847) p. 219. ^ ; George Moore, Notes on the Name YHWH (The American Journal of Theology, Vol. 12, No. 1. (Jan., 1908), pp. 34–52. ^ Charles IX of Sweden instituted the Royal Order of Jehova in 1606. ^ a b c Scholia in Vetus Testamentum, vol. 3, part 3, pp. 8, 9, etc. ^ "Non enim h quatuor liter [yhwh] si, ut punctat sunt, legantur, Ioua reddunt: sed (ut ipse optime nosti) Iehoua efficiunt." (De Arcanis Catholicæ Veritatis (1518), folio xliii. See Oxford English Dictionary Online, 1989/2008, Oxford University Press, "Jehovah"). Peter Galatin was Pope Leo X's confessor. ^ Sir Godfrey Driver, Introduction to the Old Testament of the New English Bible. ^ See Poole's comments at Exodus 6:2, 3 in his Synopsis criticorum biblicorum. ^ The First Twelve Psalms in Hebrew, p. 22. Gill, John (1778). "A Dissertation Concerning the Antiquity of the Hebrew Language, Letters, Vowel-Points, and Accents". A collection of sermons and tracts ...: To which are prefixed, memoirs of the life, writing, and character of the author. 3. G. Keith. "Tetragrammaton" . Encyclopædia Britannica (11th ed.). 1911. Moore, George Foot (1911). "Jehovah" . Encyclopædia Britannica (11th ed.). "Jehovah" . New International Encyclopedia. 1905. Maas, Anthony John (1910). "Jehovah (Yahweh)" . Catholic Encyclopedia. 8.